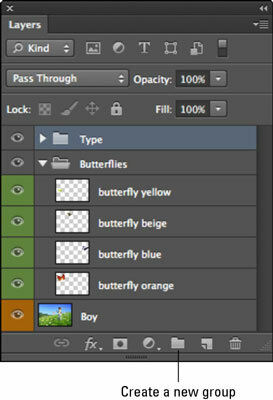 Geeks can revel in Photoshop CS6’s digital answer to the manila folder that enables you to organize layers into layer groups. You can expand or collapse layer groups to see or hide their contents. In their collapsed state, layer groups are a great antidote for the annoying scrolling that you must do in an abundantly layered file. And groups enable you to apply opacity settings, blend modes, and layer styles to multiple layers at a time. To create a layer group, click the Create a New Group icon (the folder icon) at the bottom of the Layers panel. You can also select New Group from the Layers panel menu or choose Layer→New→Group. The latter two methods prompt you for a group name in addition to a few other options (similar to regular layers). You can color-code your group and specify a blend mode and opacity setting. The default mode is Pass Through, which lets the blend modes applied to the individual layers remain intact. If you select any other mode, that mode overrides all the layers in the group. If the group is expanded, you can drag the layer to a specific location within the group. To collapse or expand the group, click the triangle icon to the left of the folder icon. Like with regular layers, you can select, duplicate, show, hide, lock, and rearrange layer groups. You can nest layer groups. Create (or drag) one layer group into another layer group. You can create a layer group from selected layers. Select the layers that you want to be in a group, and then select New Group from Layers from the Layers panel menu or choose Layer→New→Group from Layers. Name the group in the dialog box that appears and click OK. If you select a layer within a group and then choose Layer→Arrange, the command applies to the stacking order only within the layer group. You can merge layer groups. Select the group and select Merge Group from the Layers panel menu or choose Layer→Merge Group. You can rename your group by double-clicking the group name in the Layers panel. You can also choose Layer→Group Properties or select Group Properties from the Layers panel menu. In addition, you can lock layers within a group. Select Lock All Layers in Group from the Layers panel menu or choose Layer→Lock All Layers in Group.